For nearly four hundred years all economic activity in Newfoundland centred around the pursuit of the fishery. West Country merchants in England funded the expeditions of the migratory fishing vessels, outfitting and supplying them with provisions and men. With the growth of a resident population along Newfoundland's coast West Country merchants, and later local Newfoundland merchants, supplied the resident fishing families with the goods and equipment necessary in their pursuit of the fishery. Where merchants had once organized and supplied the fishing vessels heading to the waters surrounding Newfoundland, they now provisioned settlers on credit at the start of the fishing season, being repaid at the end of the season with the fisherman's produce, dried salt cod. Courtesy of Archives and Special Collections, (Historic Photographs Collection of the Department of Geography, Collection 137, Photo 1.02.004), Queen Elizabeth II Library, Memorial University of Newfoundland, St. John's, NL. As the number of merchants in Newfoundland increased to serve a rising settled population in the 19th century, the most influential and prominent of them set up shop in St. John's along Water Street. These merchants imported goods - primarily food and fishing gear in the early decades - to supply the smaller outport merchants who in turn supplied local fishermen. At the end of the fishing season, the outport merchant collected the catch, settled the accounts with the fishermen, and settled his own accounts by transporting the fish to the premises of the St. John's fish merchant who, in turn, sold it on the European market. Thus, St. John's became the centre of commercial activity in Newfoundland. In the merchant houses lining the city's waterfront the island's main export - dried salt cod - was exchanged for imports from Britain, the US and Canada. Although harsh economic realities were present in the daily lives of many fishing families, the fishing industry made some merchants prosperous. 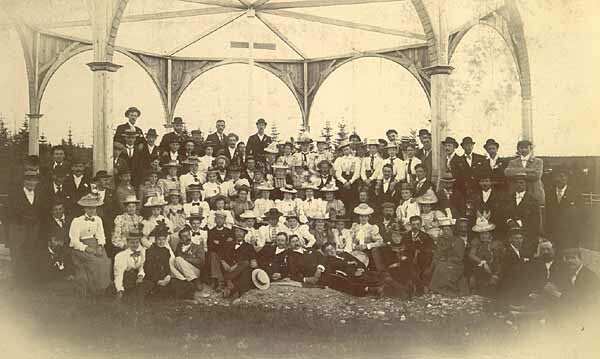 Society outings were important elements of 19th century society for more affluent individuals. Photographer unknown. Reproduced by permission of the Rooms Provincial Archives Division (VA 19-112), St. John's, NL. The St. John's merchant community in the 19th century was small and tightly-knit. Firms were passed on from father to son, brothers worked as partners, and former clerks of these firms started up their own businesses with the support of former employers. Benjamin Bowring immigrated from England to start a business in St. John's in 1811, passing it onto his sons who formed a partnership, Bowring Brothers. Another firm, Steer & Ayre, the predecessors of Steer's and Ayre & Sons, was begun by John Steer and Robert Ayre, both former clerks at Bowring Brothers, with Bowring's aid. Occasionally, merchants would pool their resources to start up a new business venture such as the Newfoundland Boot and Shoe Company, the White Bay Mining Association and the Newfoundland Pioneer Woollen Company. 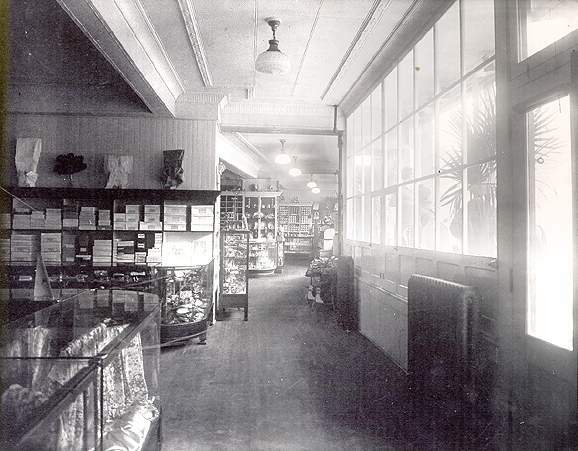 Interior of Bowring's Store, Water Street, St. John's, n.d. Courtesy of Archives and Special Collections, (Historic Photographs Collection of the Department of Geography, Collection 137, Photo 2.01.019), Queen Elizabeth II Library, Memorial University of Newfoundland, St. John's, NL. The insular nature of the merchant community, while allowing for much cooperation and mutual support, has also been blamed for many of Newfoundland's economic troubles. This is particularly evident in the 1894 Bank Crash, which was caused by an over extension of credit to St. John's merchants. The large-scale extension of credit by merchant companies to fishermen and the tendency of retiring partners in the merchant houses to withdraw money from their businesses had left many of the firms with little working capital, leading them to take out large bank loans. As many of the merchants were also bank directors, unbiased reviews of the banks' lending practices were not common. All of these factors contributed to the collapse of the banks, devaluation of the currency, business failure, and high unemployment. Although the merchants were considered largely responsible for the disaster, city merchants who were not made bankrupt by the bank crash offered aid to many of those worst affected. Rather than lay off half their workers, some firms kept employees on at half-time. To pay their workers, Bowring Brothers printed their own wages notes which were meant for use in their own stores. Because of the devaluation of the currency and the firm's relative financial stability, these notes came to be accepted at stores across the island. Despite their implication in the crash, many Newfoundlanders considered the finances of the merchant firms to be more secure than those of the banks. Some Water Street firms began offering banking services, allowing customers to deposit savings in accounts paying interest and to make purchases in the firms' stores on account. So popular were these banking services that some of the firms were in debt to their customers rather than the reverse. Some also offered loans, such as the one Ayre & Sons provided to The Evening Telegram after a fire had destroyed the presses and the owners were unable to obtain a bank loan. Courtesy of Archives and Special Collections, (Historic Photographs Collection of the Department of Geography, Collection 137, Photo 1.02.003), Queen Elizabeth II Library, Memorial University of Newfoundland, St. John's, NL. Clearly, St. John's merchants had interests beyond the fishery. In fact, events like the Bank Crash and poor fishing seasons convinced many that they needed to diversify their activities. Some invested in mining ventures, manufacturing and insurance, while others focussed their attentions on the wholesale and retail trades. 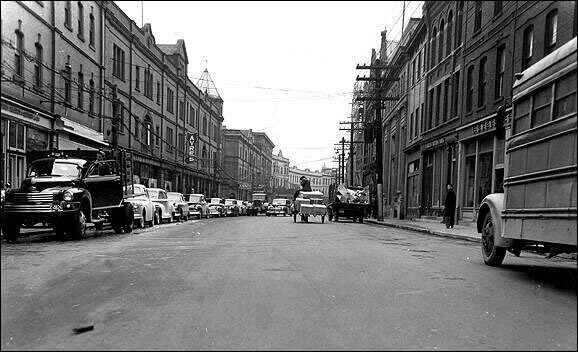 With the growth of the St. John's population, particularly that of the mercantile and professional classes, city stores began expanding their operations and their lines of merchandise. As the standard of living rose and the economy became more diversified during the 19th century, Newfoundland's imports began to include an increasing proportion of luxury and industrial items as well as food and fishing gear. Although imports fell again during the Depression, wartime prosperity reversed the trend. Confederation in 1949 accelerated another trend, and Newfoundland began to import more from Canada than either Britain or the US. 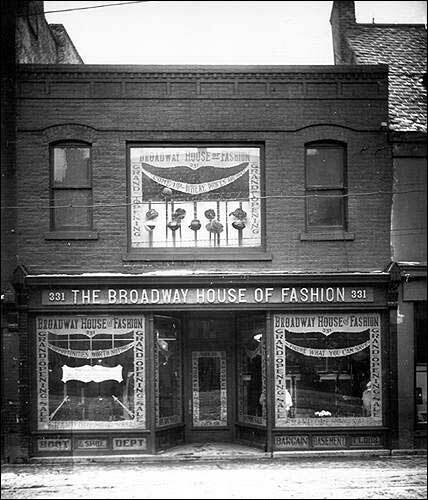 The Broadway House of Fashion, 331-333 Water Street, St. John's, n.d. Courtesy of Archives and Special Collections, (Historic Photographs Collection of the Department of Geography, Collection 137, Photo 2.01.037), Queen Elizabeth II Library, Memorial University of Newfoundland, St. John's, NL. The impact of Confederation on the merchant community has been little studied but the influx of Canadian chain and department stores had a negative effect on local business. Although many supporters of Confederation had sought to break the monopoly of local merchants on trade and lower the price of goods by introducing competition and getting rid of the tariff on Canadian imports, they probably did not intend the destruction of local merchant companies. In the long run, however, the inability of local manufacturers and retailers to produce and sell goods as efficiently and cheaply as their mainland counterparts, led to their failure. By the 1970s and 1980s, many of the old Water Street firms such as Bowring Brothers and Ayre & Sons had closed their doors or severely curtailed their interests. 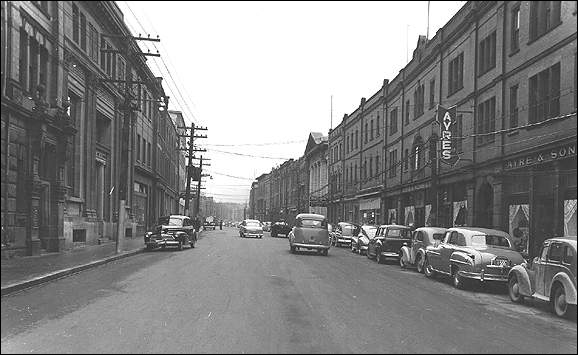 Rather than compete with a mainland grocery chain, Ayre & Sons sold off their Dominion Stores and attempted to consolidate their interests. Newfoundland continues to import many of the products its people consume while exporting primarily raw materials, a trade imbalance which has served to worsen the island's economic troubles.